View More In Ear Clamps - Page 5. 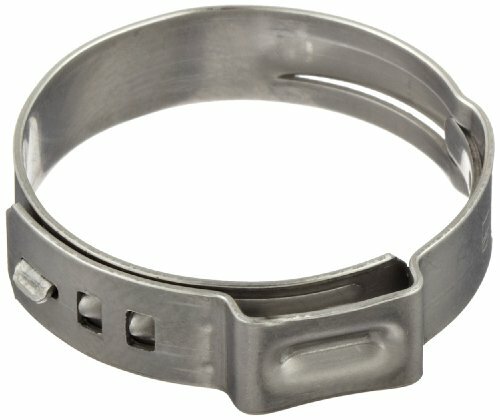 This Oetiker 167 Series stainless steel Stepless one-ear hose clamp is for clamping hoses. The dimple or indentation on the ear of the clamp increases the clamping force for a more secure hold, and the mechanical interlock of this clamp keeps it securely closed and provides better corrosion resistance than a spot-weld, which is vulnerable to corrosion. The ear is visibly deformed when clamped correctly, providing assurance of proper closure. It's also made of stainless steel for resisting scaling and corrosion. This clamp is suitable for attaching hoses to fittings or other devices for applications such as food processing and commercial fishing that involve exposure to corrosive elements, particularly salt water. Hose clamps attach tubing and hoses to fittings to prevent flow leakage, or are used for hose or wire mounting applications. They come in a variety of designs to distribute uniform pressure over the circumference of hoses to bind them to fittings. Other hose clamp types are used for mounting, strapping, clamping, and positioning hose or wire. Hose clamps are suitable for a large number of industries, and commonly used in industrial, electronic, and automotive applications. Oetiker manufactures hose clamps, rings, couplings, conveyor chains, hinged belts, and other connecting parts and accessories. The company, founded in 1942 and headquartered in Horgen, Switzerland, meets International Organization for Standardization/Technical Specification (ISO/TS) standard 16949. If you have any questions about this product by Oetiker, contact us by completing and submitting the form below. If you are looking for a specif part number, please include it with your message. Oetiker Stepless OET070170-300PCK Clamp Assortment Case, Single Ear Hose Clamps without Pincers, 1/4" - 11/16"